Magic Johnson has some tough calls to make. 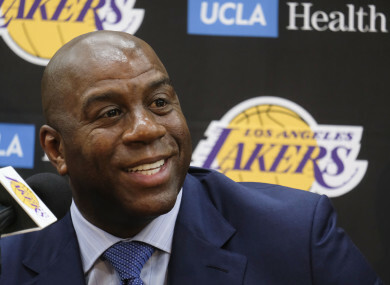 Conundrum: Lakers boss Magic Johnson. THE LOS ANGELES LAKERS are reportedly discussing a trade for Kawhi Leonard with the San Antonio Spurs, with the hopes that landing Leonard will get them LeBron James in free agency. The Lakers have prepared for the summer of 2018 for years, arranging cap space to add one or two stars to bring the team back to relevance in the NBA. However, following reports that LeBron James is hesitant to be the first star to go to the Lakers and that Paul George might stay in Oklahoma City, the Lakers may have to trade for Leonard to get the ball rolling. It’s a tricky spot for the Lakers. According to ESPN, the Spurs are asking for a huge package in return for Leonard. The Lakers, who have rebuilt over the last three years, likely have the assets to put together a package for Leonard, but it would rob them of their depth and young core. Additionally, Leonard reportedly wants to be traded to the Lakers, or he will sign with them when he becomes a free agent in 2019. That puts the Lakers in an even tougher spot — do they give up the assets for Leonard now, or wait until he can sign with them next year? Does not trading for Leonard now ruin the chances of getting James this summer? Lakers president Magic Johnson recently gave a confident statement about the Lakers’ off season, saying if things don’t go their way this summer, they will move onto next summer to go after free agents. Johnson said he’ll step down as president if the Lakers are unable to get big-name free agents in the next two years. That kind of mentality actually may be reassuring for Lakers fans — perhaps the team is not so hellbent to get James that they would sacrifice young players like Lonzo Ball, Brandon Ingram, Kyle Kuzma, and Josh Hart or future draft picks. On the other hand, there’s a danger in not striking while the iron is hot. If the Lakers balk at the Spurs’ price for Leonard, perhaps the Spurs deal Leonard elsewhere. Maybe James doesn’t come, and the Lakers have to settle for Plan B. And what if Leonard becomes smitten with wherever he’s traded and decides to re-sign there next season? What if the Lakers then can’t get any free agents next summer? These are all real scenarios and part of the gamble for a team hoping to make a sudden leap into contention. If the Lakers truly view Leonard as the piece that will land LeBron James, then a decision may be coming soon. James has until Friday to decide on his contract option, and free agency begins on Sunday. Email “The Lakers are in a catch-22 with LeBron James and Kawhi Leonard”. Feedback on “The Lakers are in a catch-22 with LeBron James and Kawhi Leonard”.